Every year millions of plastic water bottles end up in landfills and littered alongside highways, lakes, streams and beaches. You can help reduce this ecological problem by filtering your water and re-using your water bottle. The Frontier™ Sport Water Bottle filter converts any water bottle with a straw into a filter bottle that supplies great tasting, microbiologically safe water at a fraction of the price of bottled water. This is more than a "taste good" filter. 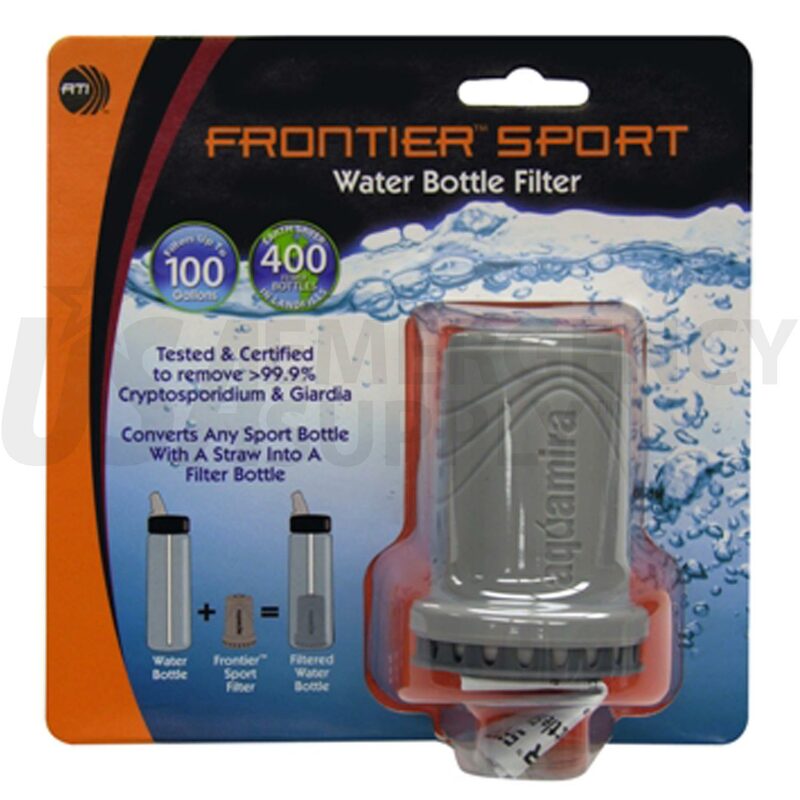 The Frontier Sport water bottle filter incorporates Aquamira® CR Filtration Technology and is tested and certified to remove greater than 99.9% of Cryptosporidium and Giardia. Activated coconut shell carbon reduces waterborne chemicals, improves the taste of the filtered water and eliminates offensive odors. Aquamira CR Grade filters have been tested and proven effective in removing Cyanotoxins such as Microcystin and other biotoxins. 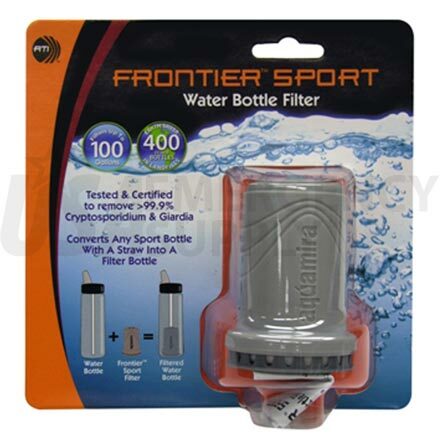 You can use your Frontier Sport water bottle filter in the outdoors, on camping trips and when you travel abroad to places where the water quality and safety may be suspect. It is also a great idea to keep one handy for emergencies. Aquamira Filtration Technology: Tested and certified to remove more than 99.9% of Cryptosporidium and Giardia cysts. Environmentally Safe and Friendly: Reduces waste by re-using water bottle. (Equal to 400 bottles of "bottled" water) BPA free. Aquamira® Filtration Technology is Tested and certified to remove more than 99.9% of Cryptosporidium and Giardia. Our two stage filtration system incorporates a high density polypropylene fiber pre-filter to screen out larger particles, and a highly efficient porous plastic carbon block final filter provides high water flow with low pressure drop. This means you can get plenty of water with out popping your eyes out of their sockets. This new and improved filtration system is so efficient that one cartridge will provide up to 100 gallons of easy to drink filtered water. Aquamira CR Grade filters have been tested and proven effective in removing Cyanotoxins such as Microcystin and other biotoxins. Activated coconut shell carbon reduces waterborne chemicals, improves the taste of the filtered water and eliminates offensive odors. Miraguard™ antimicrobial technology suppresses the growth of bacteria, algae, fungus, mold and mildew within the filter media.